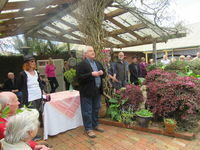 Lillico Gardens was once again the perfect setting for the launch of the 10th Gardivalia Festival of Gardens. Over 100 visitors took the opportunity to wander the extensive country garden with its colourful flowers, profuse climbers, flowering trees, productive vegetable garden, meandering paths, water features and quirky art works scattered throughout. Gardivalia was launched by Brian Hopkins from Warragul Regional Newspapers, one of the major sponsors of the festival. The enthralled visitors then converged on the Gallery for the official opening of Warragul Art Group's 'A Floral or Two' art exhibition by Des Morriss. A sumptios afternoon tea was seerved on the deck with its magnificent views over the surrounding countryside. A huge appreciation is extended to Cathy and Hadyn John who have generously donated the use of their garden and gallery since Gardivalia's inception. WIN TV captured the spirit of the day perfectly. 1 comments for "Glorious Gardivalia Launch"